Preheat a waffle iron. To assemble the sandwiches, butter one side of each slice of bread. Spread the unbuttered side of each slice with 1 tablespoon each of honey mustard and pickle relish. Top each piece of bread with a slice of cheese (break the cheese up to help totally cover the bread, if need be). On each of six slices of bread, place a mound of the pork. On the remaining bread, pile 1/4 cup of greens. Put the sandwiches together. 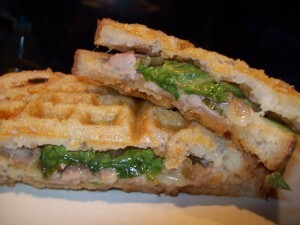 To cook them, press each firmly in the heated waffle iron and allow it to cook until the timer goes off; after one cycle, check to see if the sandwich is at your desired level of doneness. 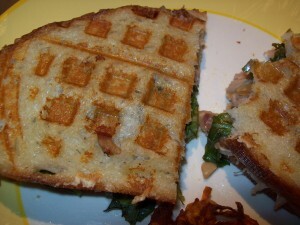 If not, allow it to cook for another 1/2 a cycle or so (this really depends on your waffle iron). What you’re looking for is a nice, pressed, waffled panini that’s golden brown and crisp.